On my Life List: Grand Teton N.P. Is there a more spectacular mountain range in North America than the Grand Tetons? I’d have a hard time imagining it. 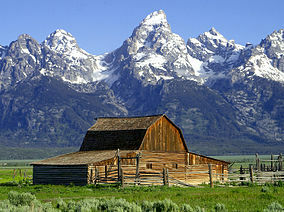 Having seen Yosemite, Zion and the Grand Canyon, I feel like Grand Teton National Park has to be next on my list. National Park Service Grant Teton hikes page. Grant Teton N.P. hikes/climbs page. Rick McCharles’ Best Hike in the Grand Tetons. The Lodges of Grand Teton National Park. Lou Dawson on ski mountaineering at Grand Teton. What would you consider a must visit and a must/avoid? If you could do only one day-hike, which would it be? What are the standard precautions? I’m sure a bunch of you have been there a bunch of times. Please weigh in with answers and links if you’ve got a minute. I’m jealous and please do! The trip of a lifetime. We did a 3-day, 2-night backpack of Paintbrush Canyon Trail over Paintbrush Divide, North Fork Cascade Trail, South Fork Cascade Trail over Hurrican Pass, Teton Crest Trail thru the Alaska Basin and Death Canyon Shelf, then Death Canyon Trail. I still can’t believe we did it. We went in mid-August and had to change our route because some places were still snowed in and required ice axes, but the lower trails were fine. A little snow is fun. I’ve been there just once Tom. It was a remarkably beautiful place. I went in 2007, before I began hiking. It was more of a drive-thru and stop at sites. The pass we were required to buy also got us into the connecting Yellowstone National Park. That opens a whole new world of possibilities. The wildlife out there is very different than that of NC. Buffalo everywhere, especially in Yellowstone, Elk, mule deer, wolves, mountain goats, and yes grizzly bears were seen in our 2 day drive thru up there. We were up there in late September, it was about 60 each day with snow on the ground, just food for thought. Hope you have a great time up there. Been twice although I have been for years eyeing the trip that Smoky Scout described (I am SOOOO envious!). I’d like to second the vote for Amphitheatre and Surprise Lakes, I have recollections of going there in early July and hillsides carpeted with wildflowers. The good and bad thing about the park is that it’s mostly super-accessible to a road and so you can do lots as dayhikes, with the requisite crowds. But it’s so beautiful that you don’t mind. Appreciate the feedback everybody … right now it’s more in the dream stage for me but it’ll be good to have all these tips in hand if things firm up. So happy you want to come check Grand Teton out! As for cool things to do, check out The Mountain Pulse’s Trail Maps+. It’s a free, interactive guide, designed by outdoor enthusiasts, to make information about activities in Jackson Hole more accessible. Incorporating Google Earth, Trail Maps+ engages audiences, allowing visitors and locals to virtually explore Jackson Hole. They are on Twitter and Facebook also, announcing a bunch of great things to do in the area. I am glad you called it a life list and not a bucket list. I’m going with a group to Yellowstone from September 18-25, 2011. I then go back with them to Billings, MT, pick up a rental car and stay till October 3, 2011. Am looking for a hiking partner and wanted to day hike Grand Teton NP. Have been to Yosemite, Glacier, Arches, Canyonlands, and Olympic National Parks. Thanks again for all the contributions … this is a great starting point for anybody having the Tetons on their mind. Check out the Jenny Lake area as that’s where most stage their hikes into the Tetons proper. Great public camp site, but fills quickly. Those hikers in the know stay at the climbers ranch just south of Jenny Lake. Also, if you’re there between Memorial Day and Labor Day, spend the $$ to have dinner at the Bar-J. Longest and most fun BBQ dinner I ever ate. I chose these two day hikes after a hopping off the Contintental Divide Trail.